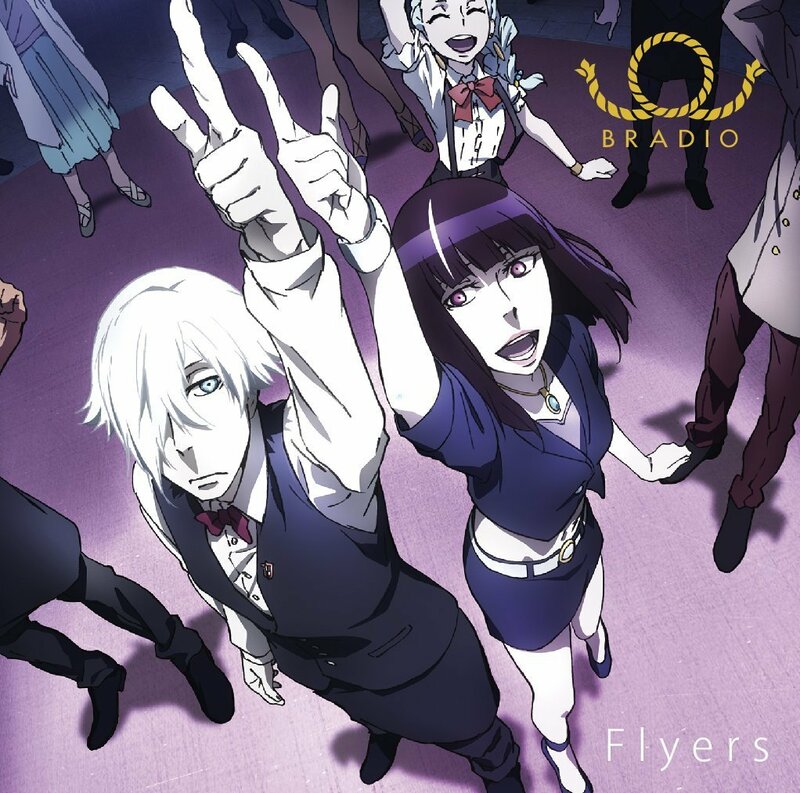 Review: To characterize Death Parade‘s opening theme, “Flyers,” as anything less than a force of nature is to sell it short. From its opening chord, the song accelerates with such momentum that it sweeps you up in its brash, bold sound. BRADIO’s co-founder, singer and songwriter Takaaki Shingyoji, deserves much of the plaudits. His opening bellow and his purposeful delivery in the stanzas draws you into the song and drives it forward. While “Flyers” is rock fusion, what sets it apart is what it fuses: the burst of ska and addition of disco send the song soaring. The latter occurs when the backup vocals unleash the “Boom, boom, boom, dancing through the skies” line which lays a catchy call-and-response on top of the head-bobbing rhythm. The resulting upbeat delivery leaves you feeling light on your feet. The catchiness doesn’t stop there either. Once you reach the chorus, the spirited cry of “Everybody! Put your hands up!” injects a satisfying dose of energy that winds its way through to the rest of the song. From start to finish, Takaaki Shingyoji’s voice remains fiery while the song’s light rhythms and lively energy makes you want to get up and dance the night away. Even though there’s some dissonance to be had between “Flyers'” party hearty atmosphere and the ghastly subject matter that Death Parade embraces, the song itself is a load of fun. The DDR, ballroom dance, and can-can sequences that accompany the song become the bonus icing on a very enjoyable cake. After the lovely rush that is “Flyers”, you don’t really expect much out of the B-side. Even then, “Kanjou Literacy” is decently enjoyable in that it fits the mold of a rock song that packs a good punch. The lyrical lines are full of Takaaki Shingyoji’s energy and the chorus isn’t shabby either. The vocals carry the song well, especially when bolstered by a catchy rhythm andenergy without recycling itself. Through these two works, BRADIO’s anime debut has proven to be a strong one. If there’s anything that’s certain, it’s that “Flyers” will prove difficult to top, and that’s not a bad thing. Either way, we can hope that their participation in the world of anison will become more than just this exciting one-off as their music continues to charge in to keep us dazzled by their funky party atmosphere. That… was really fun! What a ridiculous song, but so damn catchy! Yeah, it’s able to seize you with its energy without making too much of an effort. And a whole lot of fun besides. I certainly have the chorus part stuck in my head for a while now.